Heating is an essential process in domestic and industrial applications. There are multiple types of heating methods in which microwave heating is one of the recent discoveries. Microwave heating is an efficient, economic, green and faster. Uniformity of heating is better than any other method. Microwave heating is being used widely in domestic, commercial and industrial applications. Domestic and commercial microwave ovens are used to heat mostly food products at homes restaurants and bakeries for their faster heating. While industrial microwave ovens are used in food, rubber, ceramic, pharmaceutical, polymer, plastic, textile processing etc. Industrial microwave heating has an advantage of faster, green, uniform and economic way of processing compared to conventional heating methods. Domestic and commercial microwave ovens are commonly fixed power supplies. Which mean power can either be zero or full power. These are available from 800w up to around 2000w. These ovens apply ON-OFF control to get variable power control. In ON-OFF control, keeping a constant time the power supply delivers full power for some amount of time while for remaining time, microwave generation is switched off. Amount of ON and OFF time vary depending upon the amount of power, keeping the total time (ON+OFF time) constant. These ovens use electrical wiring called doubler. A different type of ovens are also available in which SMPS technology is used. These type of ovens are more compact and more efficient than doubler type, but relatively costlier. These are variable power supply ovens, in which power can be varied instantaneously. Some ovens along with microwave, have feature of convection. These will have a heater and a convection fan to blow the hot air on to the food being heated. These mostly work on 2.45GHz frequency. On the other hand, industrial microwave ovens are doubler type, SMPS type and triac/thyristor control type. In triac/thyristor control, power can be instantaneously varied. 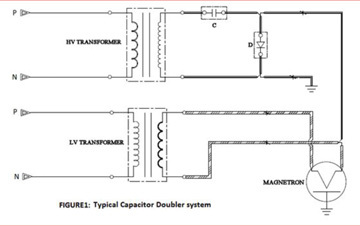 Thyristor/triac control type vary the power by controlling every half AC sinusoidal wave. This technique is called as phase angle control. Industrial microwave power supplies are available from 800w to hundreds of kilo watts. Ovens are also available with hot air circulation to have more efficient heating along with microwave heating. While 2.45GHz frequency is vastly used, 915MHz, and 5.8GHz frequencies are also used in some cases. All these microwave ovens come with a safety oven door interlock. Intentional or accidental opening of microwave oven door switches off microwave generation. 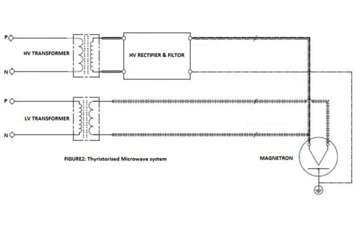 Magnetron body temperature is also monitored and used as an interlock to stop microwave generation in case the temperature has gone beyond around 80 deg C.
Doubler based ovens use voltage doubler also called as capacitor doubler. These power supplies have a step up transformer a capacitor and a diode. A basic schematic is shown below. These are half wave voltage doublers, also called as Villard circuit. Capacitor is charges during consecutive half wave and discharges during consecutive half wave of AC sine wave. Microwaves are generated only during discharging half wave. Doubler employs very less components which makes it more simpler and economic. But because there is no feedback loop to monitor the power delivered, system becomes less reliable. Doublers are used with microwave power supplies up to 1.5 to 2kilowatts of power. Most of the domestic and commercial microwave ovens are fixed power, on-off type, capacitor doubler systems. Thyristor/triac based ovens work on the principle of phase angle control. A tryristor/triac based power controller is used to control/regulate the AC power. This regulated AC power is fed to a step up transformer which increases the voltage to thousands of volts. This high voltage is then rectified and filtered. A basic schematic is as shown below. SMPS (some time also called as inverter technology)based power supplies are more complex than other two types. AC supply is first rectified and filtered. 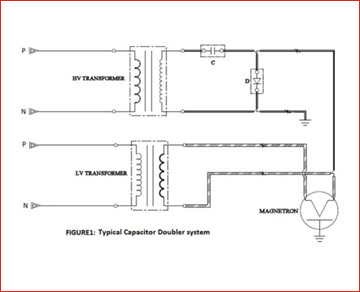 With help of pwm controllers, this dc voltage is converted to high frequency AC voltage and fed to a step up transformer. High voltage is then rectified and filtered to get high voltage dc. SMPS power supplies have the advantage that size of the step up transformer decreases with increase in input AC voltage frequency. These are more efficient and compact than other two types. But complexity and cost involved are high. All the possible power values microwave ovens can be built with SMPS. All the three type of power supplies, i.e doubler, Thyristorised and SMPS based power supplies are available in industrial microwave ovens. While most of the domestic and commercial microwave ovens are doublers. SMPS based power supplies also exists but are rare. Domestic microwave ovens are meant to be used not more than 5 times a day, and commercial ovens can be used around 200 times a day. While a industrial microwave oven is meant to work continuously for 24X7 in an industrial environment where temperatures may rise up to 55 to 60 deg C.
Industrial ovens may have more than one magnetron to meet the requirement of higher power, which also contributes to better uniformity of heating. Domestic ovens are constructed out of mild steel sheets to make it cheaper, while commercial and industrial ovens are made up of stainless steel. Industrial microwave ovens have outer body of from 3 to 10 mm depending upon the applications. Also the electrical components are over rated to work in harsh conditions of industry. Industrial Microwave batch type furnace ‘Micro heat MH5814’ of oven cavity of 7150 cubic inches can be operated up to 1400 deg C. It has 4 magnetrons of 1.45kw each which make 5.8kw of microwave energy. Oven is made up of SS-304. It has 2 oven door interlocks for accidental opening detection, magnetron over temperature interlock for each magnetrons, and a power supply door interlock to avoid accidental electrocution while the system is operational. Proper insulation is made so that oven outer body temperature doesn’t go beyond RT+50 deg C(RT- Room Temperature) even when the sample is at 1400 deg C.
There is gas and vacuum provisions to conduct the experiments in vacuum, argon, hydrogen, nitrogen or any other gas environments. Contact less IR pyrometer is used to measure the sample temperature. Microwave power can be controlled either manually in manual mode by a potentiometer or by a PID/PLC/PC in auto mode. Sample temperature, individual microwave power, and mode of operation can be monitored by a PC by data acquisition system. Microwave heating technology is a new to the world, at least to the third wold. This technology is vastly used in US and Europe and almost every house has a domestic microwave oven. It is also used by many industries in these countries. People are to be educated about its benefits in domestic and industrial sector. Higher initial cost is the hurdle for it’s popularity. But once bought it can save lot of money and time.